Unfortunately, since the release of Fallout 2, there was a tendency: with each new game we cut in choice of skills. In cancelled Van Buren all weapon-firing skills had merged in one, though it had been compensated by sharing skill «Speech» on three components. 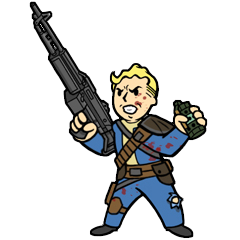 In Fallout Tactics some skills had been simply inapplicable. But true genocide had begun with changeover in 3-dimensional world, namely with Fallout 3. Here we have started to cut to the maximum. Native skill cap had fallen from 300% to banal 100%, moreover, some skills were absorbed, and some skills is missed. «First aid» and «Doctor» were spliced in one skill «Medicine», «Throwing» had disappeared without a trace, as «Gambling» and «Outdoorsman». 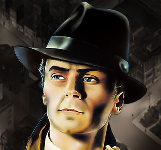 Much loved «Steal» had ceased to exist as a skill, has being absorbed by «Stealth» and in fact, it become almost main function. Same thing with «Traps» which was converted to banal «Explosives». 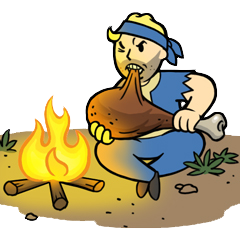 In New Vegas we kind of got back «Outdoorsman» skill, naming it the term, which more appropriate for it, «Survival». BUT... Where's heavy weapons? Where's «Big Guns?» They're had simply joined in «Guns», argued it, that it's firearms (of course, colt and six-barrel minigun have one shooting type, who argue). 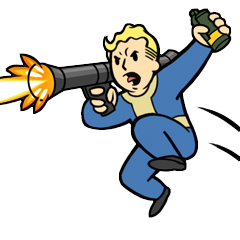 For the same reason flamethrowers became energy weapons, and all weapons, which attacks leads to explosion, had become explosive (again, throw a dynamite and shoot from rocket launcher are quite similar actions, of course). And why all this things happened? Because guys from Bethesda, for some reason, were too lazy to increase skills limit, which was decreased in Fallout 3. We won't delve into the details, just say that it's not fair. Why it's not fair? Because there is an option in G.E.C.K. which adds new skil, but it's locked for us, common players, who recreating favourite part on base of more new. So, we had to be content with that quantity, which we have. 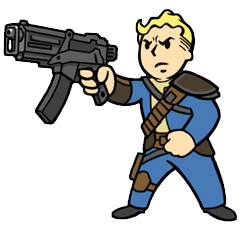 Recently I read thoughts of Josh Sawyer (that guy who likes joining skills) on his blog concerning weapons in New Vegas and future parts. I won't focus on aspects of this message, because I personally don't fundamentally agree with much, but I wil say: ideas about draining all weapons in one skill and their cuts in general, (how dare they, infringe on the sacred) tossed one, precisely some similar ideas, aimed at some correction of current situation. It's true, there's no difference in shooting from sniper rifle or laser rifle, which design looks similar. It's just a question of recoil. And during the not-so fair and open team vote we decided to delete some skills for the good of the return of some old ones. So, as I wrote above – we're not allowed to create new skills (and offensively banal can't: functions is, access is not), but we can edit current skills, precisely their names and descriptions (and apply it later, where we need to do it). First of all, we returned namely «Big Guns». And the victim was none other than skill «Energy Weapons». 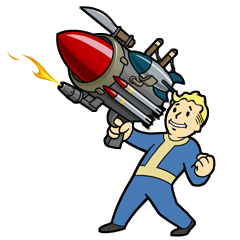 In this way we returned heavy weapons and sharing "Small Guns" from Fallout: New Vegas on two types. Energy weapons won't go away, it will stay as a weapon of effective destruction of enemy, but by its dimensions wil be set to one or another type of small arms (for example, basic guns – light, and guns like Gatling Laser - heavy). What about some questions about crafting, energy weapons will require much higher skill «Science» and «Repair» in addition to necessary knowledges in weapons. But that is not all. «Unarmed» and «Melee Weapons» joining in skill «Close Combat» and clears place to the return of another skill. It became the «Throwing». The same with skill «Explosives». It's replaced by «Traps», and now it's in charge for all types of traps and their elimination (or installation), without difference, is this thing explodes or snaps on curious limb. Finally, «Survival» skill will remain the skill of survival in Wasteland, performing duties of skill «Outdoorsman» on World Map and its own of catching and preparation the inhabitants of Wasteland.